After I disembarked from the ferry that carried me from Helsinki, Finland, to Tallinn, Estonia, I hopped in a taxi to my hotel, the Savoy Boutique Hotel, just a few minutes away in the Old Town. My room wasn’t ready yet, but the exceptionally helpful receptionist with the very un-Estonian-sounding name Jane handled my reservation, my luggage, my questions, and my abominable pronunciation of every Estonian word with aplomb. 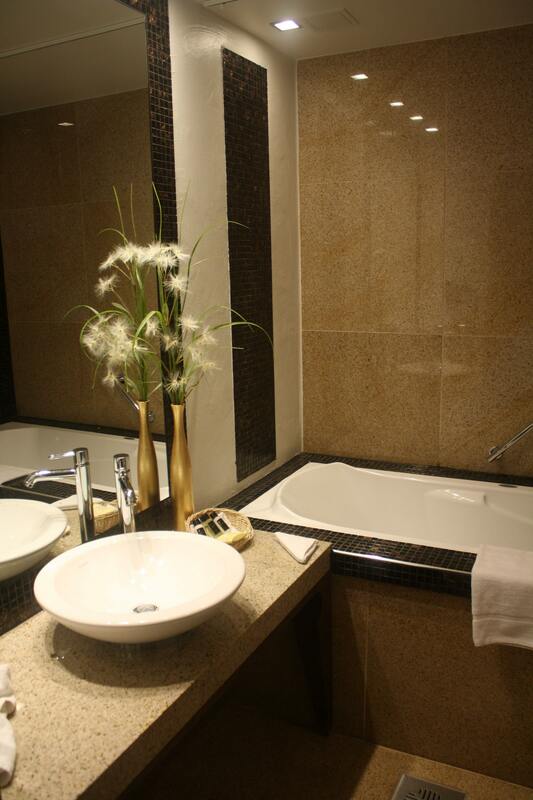 Your bathroom could easily pass for a luxurious spa. When I returned later on, a glass of cranberry juice with blueberry syrup awaited me at the front desk in the bright, polished lobby, and my bag had been brought to my room, just a couple of the nice touches that make this hotel a perfect choice within the Old Town. Constructed in 1890 and completely renovated in 2006, the Savoy Boutique Hotel has been winning awards for years now, and after four nights here, I can attest to the accolades. One of 44 rooms and suites, my room had a large bed and a desk, with rough walls that might evoke the inside of a medieval castle. The spa-like bathroom, however, was pure 21st century, with a bowl sink, a very high tub that I actually had to climb into, and bath products by Floris, the British family perfumers who have been around for nearly 300 years and whose products pop up in a number of James Bond movies. The longer I spent in my room, the more fine details I noticed: the custom-made Italian furniture, the curtain rods forged by local blacksmiths, the wide windowsills of Estonian limestone. Every morning, I would take the tiny elevator or the graceful staircase down to the lobby to have my continental breakfast, supplemented with some scrambled eggs and sausages, in the restaurant that faces the lively intersection just outside its doors. And every night, after spending a full day in this remarkable city, from exploring Kiek in de Kök and the Bastion Tunnels to savoring a fantastic dinner at Kuldse Notsu Kõrts, and then perhaps a drink at the hotel’s popular MEKK bar, I would return to my room for a full night of undisturbed sleep, aided by luxurious linens, by pillows I selected from the hotel’s pillow menu, and by the thick windows that sealed off the sounds of the city below me.